NIA CHARLESTOWN NEVIS (October 01, 2014) — Deputy Premier and Minister of Tourism Hon. 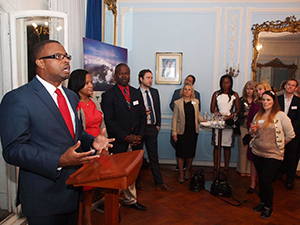 Mark Brantley along with staff from the Nevis Tourism Authority are visiting the United Kingdom and Scotland. Already their promotional visit is generating positive media coverage. An article which appeared in The Herald, a London newspaper, dated October 01, 2014, entitled “Tourists targeted by island paradise” by Simon Bain, Business Correspondent/Personal Finance Editor spoke of Nevis as an exclusive Caribbean island that wanted to attract visitors from Scotland. “Scottish holidaymakers are being wooed by an exclusive Caribbean island with only 400 hotel beds and a roll call of celebrity clients. “Nevis, population 12,500, despatched its deputy prime minister at the head of a 20-strong delegation to Glasgow yesterday in search of recession-free Scots prepared to dig deep for a luxury break. “The 36-square-mile island, where Princess Diana once holidayed with her two sons, “prides itself on being completely unmarred by modern trappings, with no fast food outlets, coffee shop chains or casinos”. “At Barrhead Travel, which was hosting a ‘speed-dating’ meet-up with the Nevis delegation for its agents, spokeswoman Lesley Temple said: “It is not your mainstream Caribbean, it fits in pretty well with our luxury store.” She said the company which has 54 stores had seen a “substantial increase” in demand for luxury travel over the past 18 months. “Barrhead said last week that 2013 profits had jumped by 12.5 per cent, this year’s sales were 20 per cent higher, and forward bookings for 2015 were up 41 per cent. “Glasgow-based Minoan Group, which owns Stewart Travel, has also reported buoyant trading this year,” the article read. The Nevis delegation’s visit to Scotland was part of the second annual “Know the UK Grow the UK” marketing trip organised jointly by the Nevis Tourism Authority and the St. Kitts Tourism Authority in partnership with British Airways. The rest of the delegation is made up of Chief Executive Officer of the NTA Greg Phillip and Julie Claxton who is in charge of the UK and Europe market. The team was also accompanied by Sponge Marketing, the Authority’s public relations and marketing firm in London.